Cook onion, garlic and basil in 1 Tbsp oil in a 4-quart heavy pot over moderately high heat until onion is softened (about 3 minutes – but I usually do them longer). Add wine and boil until reduced by half (about 3 minutes). Stir in tomatoes and salt, then reduce heat and simmer briskly, stirring frequently, until slightly thickened (about 8-10 minutes). 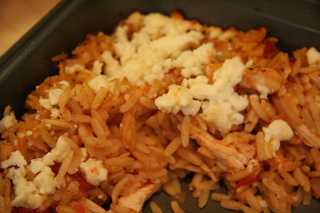 While sauce is being prepared, cook orzo to al dente (don’t overcook, as it will become mush in the sauce). Reserve 1/2 C. of pasta cooking water and then drain orzo. Return orzo to pot and toss with remaining 1 Tbsp of oil. Stir in sauce and chicken, then reserved cooking water (note: I generally don’t add much of the water (if it looks dry, I add just a bit of it), then add olives, salt and pepper to taste.